Do you throw away dull drill bits? Or toss them in a shop drawer, never to be used again? 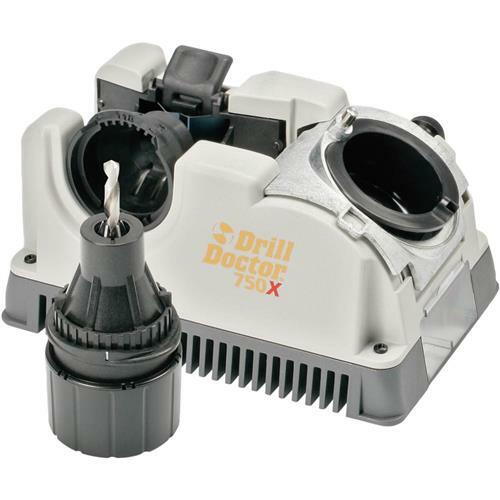 The Drill Doctor® puts the diamond grinding power of a professional sharpening system into your shop so you can bring those high speed carbide and expensive cobalt drill bits right back to life. Able to handle 3/32" to 3/4" bits, this Drill Doctor® Sharpener adjusts to accurately renew conventional, split point and masonry bits. Replacement sharpening wheels available: H9053 and H9054. Please note: Due to the high incidence of fraudulent transactions with orders containing power tools, orders for this item must ship to the billing address. May be something you don't need because of the ease and number of available drill bits, but when in a pinch it does a fine job. It works. Not much too it . But it sharpens bits good. Have only used it once so far but I found the instructional DVD helpful and the tool itself is very intuitive. Nasty dull bits turned out beautifully sharpened.